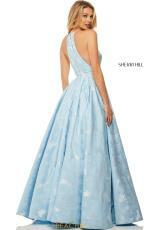 This ultra flattering Sherri Hill prom dress 52630 features a high neckline and a line silhouette. The high neckline highlights an illusion inset along with the sides, giving the appearance of low cut sides. The gorgeous printed fabric comes in an array of stunning colors that are sure to stand out in a crowd. Add some sparkle with iridescent earrings and a matching bracelet all from Peaches Boutique in Chicago.